We tracked performance over the course of one year using sales from the previous year as a baseline. As a group, Representatives who invested in coaching achieved productivity gains while those who focused solely on selling failed to meet their previous year's sales levels. 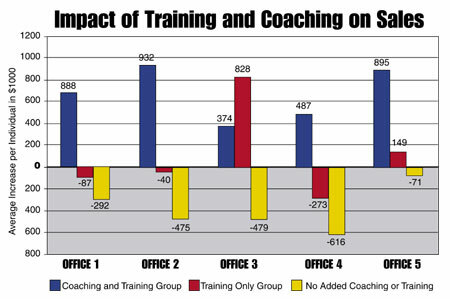 Coaching and training clearly pay! Do you want to increase sales? We offer three results-oriented programs designed to create a client focused sales force. Your team will develop increased self-confidence, learn to set and achieve goals, convert more prospects into clients and sell to people the way they are most comfortable buying. Our Full Spectrum Approach to Leadership  has transformed corporate cultures. If you want to enhance cooperation, improve relationships, increase productivity and develop a solutions-oriented environment that focuses on the big picture while achieving day to day goals this is the leadership program for you. The leadership series includes a memorable approach to communicating with others and practical applications of key leadership principles essential for managers, supervisors and executives. For those more advanced in leadership skills, we recommend our program, Beyond Leadership: Coaching Your Staff to Optimum Performance. Communicating Across Your Full Spectrum  is an energetic, fun filled program that gets people talking and listening in a whole new way. Learn to communicate with people in the way they are most apt to listen, teach the way they learn best, sell they way they are most comfortable buying. After attending this program, youll be amazed at how effectively you are able to communicate  and people- watching will never be the same again! This program is appropriate for schools, industries, and families and can transform your life. 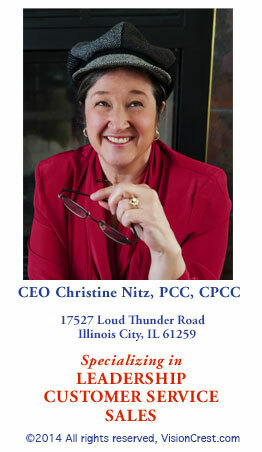  J. Weakland, BP, Inc.
Our staff loved working with Christine. We saw an immediate improvement in their ability to get along and to accomplish goals. Charles Johnson, CEO; Rail Services, Inc.